How to get #1 position on Google Malaysia? I can tell you. I DON’T KNOW! But heh, I am up there, in first position out of 589 million results. That’s number one because the first two are paid results, i.e. people have to pay a lot of money to stay there. I am going to cherish this for just a wee bit because like everything, things go up, things come down. I don’t expect to stay there permanently, maybe just a moment. BTW, if you guys catch my ad on PPS, can you take a screenshot for me? I place a targetted ad on PPS but haven’t seen it so far. Then, again, I don’t visit often because we are seeing the same old political news. Sienz. Nope, haven’t seen it yet. I saw it twice today! Thought you would have seen it too. And my first visit here this morning was via that Ad! Hahaha… thought I sapot a bit mah. 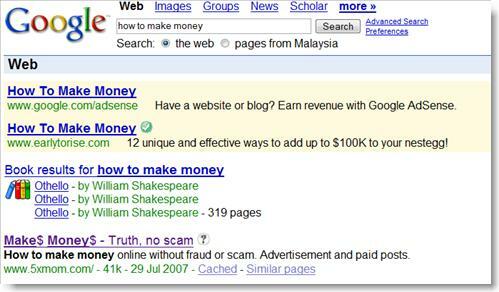 just type “paid to blog programme” on Google and also on Google Malaysia. AIYOH …. i thot i will get loads of GREAT TIPS on how to make my BLOG no.1 on Goooooogle! Tks for sharing so far all the stuff u have learned and gone thru!! Appreciate it!! And oh yes… got the screen shot on your Ad on PPS!! How do i send it to U? Can’t find your contact link. Eh…if we click on your ad to get here (like what Ah Pek did), does that mean you have to pay for it? gaman – Yeah, it has been there for a while, I am enjoying it while it lasts. I know they won’t be like this forever. pablo – Of course, but hehehe, not expensive lah and moreover it is good to pay back to PPS.